Sechs dänische Schüler erhielten den Auftrag, mit ihrem Mobiltelefon Fotos aus ihrem Leben zu machen, auf Flickr hochzuladen und gewisse Bilder für einen Aufsatz zu verwenden. 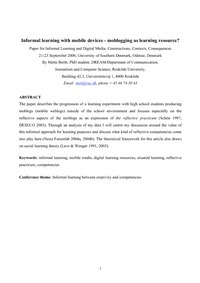 The paper describes the progression of a learning experiment with high school students producing moblogs (mobile weblogs) outside of the school environment and focuses especially on the reflective aspects of the moblogs as an expression of the reflective practicum (Schön 1987, DESECO 2003). Through an analysis of my data I will centre my discussion around the value of this informal approach for learning purposes and discuss what kind of reflective competencies come into play here (Nesta Futurelab 2004a, 2004b). The theoretical framework for this article also draws on social learning theory (Lave & Wenger 1991, 2003). This paper describes a learning experiment in which eight Danish high schoolers were loosely instructed in how to make a 'moblog' (mobile weblog) using the photoblogging site Flickr. The students' assignment was to take pictures of their everyday life for a week with their camera phones and then to incorporate some of the pictures into a Danish essay on a 'good experience'. Thus the moblogs were used as a room for reflection and framing of their daily life. The moblogging experiment in particular serves as a basis for discussing whether mobile phones might facilitate learning processes, thus placing the experiment in the budding academic field of mobile learning. In the coming years, children will be coming into classrooms with increasingly powerful mobile technology that has the potential to disrupt classrooms as environments of carefully managed conversation. This is a real conflict, because for now it results in the exclusion of mobile technology in the classroom. At the same time, however, these devices have the potential to create new worlds through enriched interaction. Such interaction is expressed e.g. through the means of talking, texting and taking pictures with a mobile phone.